Half term is when everyone traditionally starts thinking about what to buy for Christmas. We obviously have our hampers which can be one of our suggestions or bespoke, and we love helping you to decide on the contents. We have whicker hampers and luxury gift boxed hampers. 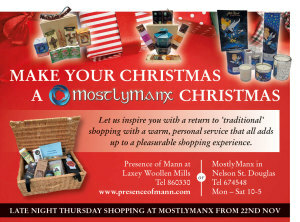 We have an amazing selection of local gifts and Manx Christmas decorations. Christmas candles and diffusers from Breeze candles, Christmas puddings from Berries in Port St Mary, Chorizo and bacon from Close Leece Farm. Soaps from goats milk, soaps and body balms from Lovely Greens and Handmade Manx themed Christmas crackers with Manx quizzes and gifts in them. Looking for a special Christmas card to show the world our heritage, we have Christmas cards from Jeremy Paul, Nicola Dixon, Chrissie Moss, Tracey Dean, John Hancox, Kasia Mirska and handmade ones. Our opening hours for November and December are Mon-Sat 10-5.30 with late night opening on Thursdays from 22nd November.